Only weeks after much of mainstream media was proclaiming its victory in the 41-month Syrian conflict, the Assad regime is facing defeat on two important fronts. In the north, the Islamic State is consolidating its control of the Tabqa airbase, the last regime position in Raqqa Province. The complex suddenly fell to the jihadists after a week-long assault, threatening to isolate the Syrian military to the east in Deir Ez Zor and Hasakah Provinces and to expose regime positions in Aleppo Province in the northwest to attack. 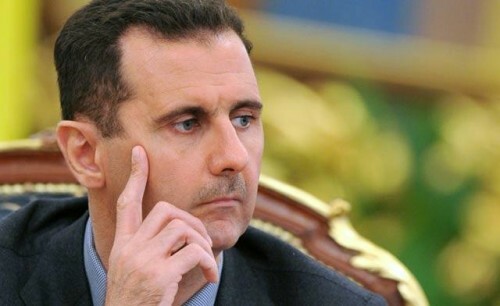 The defeat may also limit the Assad regime’s aerial supremacy, its main advantage in the fight against insurgents, because of a parallel opposition assault near Hama in central Syria. The insurgents are within a few miles of both Hama city and Hama Military Airport, restricting the use of that important base with rocket attacks. Having taken a series of villages to the west and north of Hama, the insurgents are now attacking the town of Mhardeh to the northwest. They are also reportedly inflicting heavy casualties as Syrian forces try — unsuccessfully — to counter-attack and lift the siege of the airport. We have an analysis this morning, The Assad Regime Is In Serious Trouble Near Hama. Insurgents have taken the last border crossing with the Israeli-controlled Golan Heights in southwest Syria. The opposition had already taken most of the territory near Quneitra, although control of the town is still disputed. The crossing was taken by a coalition of insurgents, including the Islamic Front, the Free Syrian Army, and the Islamic faction Jabhat al-Nusra after heavy clashes. The Syrian Revolutionary Front is now overseeing the crossing. Well-placed sources report that the villages of Tal Kroum and Rawadi have been captured, with fighting ongoing in Jaba and insurgents still advancing. Fifty regime soldiers have been killed, with 13 fleeing to the sanctuary of UN forces. One Israeli soldier was wounded by mortar fire from regime forces trying to hold back insurgents. Israel has retaliated with artillery fire on a regime position on Tal Mhayres, inflicting an unknown number of casualties. Earlier today, fire from Syria injured an IDF officer. In response, we struck 2 Syrian military positions in the Golan Heights. NextGaza Daily, August 27: Gazans Celebrate Truce — But What Has Been Resolved?